Breast Cancer Action is led by a volunteer Board of Directors, a remarkable group of people who set the vision for BCAction and lead the organization by determining organizational policy, assuring the organization’s financial security, and representing BCAction’s views to the world at large. A small, hardworking, and incredibly able staff make the Board’s vision a reality. We’re recruiting new members now – find out about joining BCAction’s Board of Directors. Dr. AJ is a community-based multidisciplinary researcher whose work seeks to increase quality of life for underserved communities through mixed methods research, the development of instruments (surveys and assessments) and technology, and the implementation and evaluation of innovative programs. Dr. AJ has worked in research for over a decade in various capacities and fields as she has earned a B.A. in Journalism, M.A. in Cultural Anthropology, M.P.H. in Applied Biostatistics and Epidemiology, and a Ph.D in Psychometrics. She is the Founder and CEO of DataStories by Seshat, LLC, a research and data analysis company. Dr. AJ came to cancer research after her best friend, Candice Rice, was diagnosed for a second time with breast cancer. Since then, she has engaged the field by participating in community-based partnerships that explore cancer etiology and test culturally-relevant interventions on survivorship and quality of life. Unfortunately, Candice did not survive treatment, and Dr. AJ has lost even more friends to this disease, including two mentors and another dear friend. Thus, Dr. AJ has committed to engaging this work in a variety of ways including research, policy, and supporting Breast Cancer Action. Abigail Arons, MPH, is a research associate at the Bixby Center for Global Reproductive Health and the Philip R. Lee Institute for Health Policy Studies, both at the University of California, San Francisco (UCSF). Her work focuses on social and behavioral aspects of reproductive health, including teen pregnancy prevention and access to sexual health education and services. She has worked at UCSF for over 10 years, conducting program evaluation and policy research. Abigail was diagnosed with breast cancer in the summer of 2009 at age 31. While she has a family history of breast cancer, and always knew the possibility that she or one of her sisters might develop breast cancer, the diagnosis was still a shock. Throughout her experience of treatment, she educated herself about treatment options, worked with her doctors to make decisions that felt informed by both science and her own values, and provided and received support from peers in a local breast cancer group. Through informal and formal networks, she continues to be amazed at the frequency of breast cancer diagnoses among young women, and inspired by the strength with which each newly diagnosed woman faces the disease. Dr. Barrett has over forty years of leadership in public, nonprofit and private sectors in the areas of program development, administration and public health practice. In her last Federal Public Health Service position, Dr. Barrett created and served as the Director of Minority and Women’s Health in the Health Resources and Services Administration’s Bureau of Primary Health Care. Retired since 2003, she is the founder and principal of S.E.B. and Associates, LLC, and currently consults on and provides training to health professionals on a wide range of issues including: public health, primary care and oral health, minority and women’s health disparities, health literacy, language access and cultural competency. Her clients have been both global and domestic including government, nonprofit associations and NGOs. In Australia, Dr. Barrett provided consultation to the Centre of Culture, Ethnicity and Health on an initiative to develop health literacy curriculum and provide training to service providers in Victoria. Before rotating off of the Institute of Medicine’s (IOM) Roundtable on Health Literacy, after being an active member for six years representing safety net providers, Dr. Barrett spearheaded the development of the IOM’s Oral Health Literacy Workshop. She is currently serving on the technical working group that created the revised SOAR curriculum that was sponsored by two Public Health Service entities, the Agency for Children and Families and OASH’s Office on Women’s Health. Dr. Barrett also participated in the development of the PHS ACF/OWH Look Beneath the Surface Campaign on human trafficking. Dr. Barrett continues to serve on a number of committees and Boards. She is a Board member and Secretary for the Intercultural Cancer Council (ICC) and serves as the organization’s Mid-Atlantic ICC Regional Leader. She is also a Board member of the Gaston and Porter Health Improvement Center. She received her Masters of Science at Columbia University’s School of Social Work in New York and her Doctorate in Public Health at Morgan State University’s School of Community Health and Policy. Dr. Barrett also serves as an adjunct professor in the Public Health Sciences Program at the University of Maryland-CP at the Shady Grove, Maryland campus. She was compelled to serve on the Breast Cancer Action Board of Directors because women are being diagnosed with breast cancer at earlier ages and the disease often goes undiagnosed because women believe they are too young to have developed the disease, and doctors often tell patients they are too young to have breast cancer — a paradigm that needs to shift. She also believes there is a direct link between breast cancer and the environment. Therefore, she’s most interested in exploring environmental factors that may impact women’s susceptibility to breast cancer. Being part of Breast Cancer Action’s Board allows her to reengage in her advocacy and grassroots activities. Mary Ann lives in Gainesville Florida. She is a Professor in the School of Social Work at the University of Central Florida in Orlando and also works as the Coordinator for the North Central Florida Cancer Collaborative (NCFCCC). Mary Ann started her career in women’s health in the late 1970s as an abortion counselor at a feminist women’s health center. That experience of supporting women moving through emotionally and politically charged moments in their lives and working with other women in a participatory management philosophy moved her to get trained in clinical social work and social science research. For five years she also worked on the Long Island Breast Cancer Study Project funded by the National Cancer Institute. This project was designed to monitor screening rates in the region where breast cancer incidence was higher than other areas in the country. This experience moved her into her life-long focus – investigating system level variables impacting the patient experience with breast cancer and advocacy for equitable access to quality cancer care. Amy is a native of the San Francisco Bay Area and has worked in the tech industry for more than 10 years across enterprise, startup, and homegrown companies. Her roles include software engineer, product strategist, and most recently co-founder of Qalaxia, an educational tech startup. She holds a B.S. and M.S. in Computer Science from San Jose State University. Amy’s mother and maternal grandmother both live with breast cancer. She’s excited to join the Board of Breast Cancer Action and aims to address the breast cancer-related issues around underrepresented communities. She is also focused on inclusion, women, education, food access, and socioeconomic gaps. Laura has a background in program development and management with more than 25 years of experience in local and national non-profits, the public sector, and philanthropy. She has worked in a variety of areas including public health, youth development and leadership, and environmental justice. She spent ten years working in program development, technical assistance and training as well as grant management for national service at the San Francisco Conservation Corps (SFCC), Youth Service America, and the Corporation for National Service, where she managed a grant portfolio of nearly $10 million serving 13 national non-profit organizations. In the late 1990s, Laura was the Director of New Site Development at City Year AmeriCorps. She also served as the Associate Director for Network Development with CLEARCorps, a childhood lead poisoning education and prevention program at the Shriver Center at the University of Maryland Baltimore County. Laura received a bachelor’s degree in psychology and completed coursework for a M.A. in Development Psychology from San Francisco State University. Peggy is the Director of the Operational Excellence Program Office at UC Berkeley where she leads a number of initiatives that are focused on reducing the cost of administrative operations and generating new revenue. She has more than 25 years of experience in business management and information technology. Peggy was diagnosed with breast cancer in 2011. 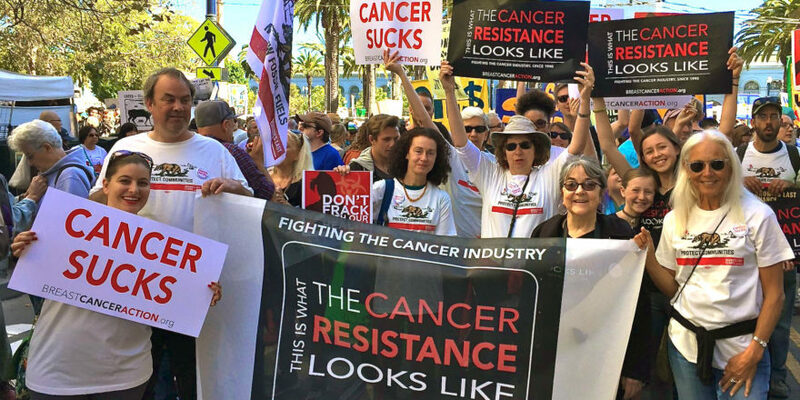 In addition to the emotional shock of being threatened by cancer, and the physical trauma caused by chemo and radiation, she was also dismayed to learn of the pervasiveness of the disease and the “production line” approach toward treatment. While chemo and radiation has become easier to tolerate than it was 40 years ago, and screening mammograms are now common, she learned that we have not made much headway in decreasing the occurrence of the disease. Peggy is motivated to help educate others and begin to change the future of breast cancer. Gail Kaufman has more than 50 years of experience as an educator and civil and women’s rights organizer and activist, and she will be re-joining Breast Cancer Action’s Board of Directors after a hiatus. For the past 18 years, Gail worked with the University of California, Berkeley as the Deputy Director of the Center for Educational Partnerships. She led the Center’s work on building and strengthening college- and career-going culture in K-12 and community college. This work focused on systemic change in schools and districts, curriculum development and professional learning, as well as creating schools to increase access and success in higher education for low-income, first generation students of color and their families. Gail’s extensive women’s rights organizing began when she became a member of the Coalition for the Medical Rights of Women (CMRW) and co-director of the Committee to Defend Reproductive Rights (CDRR). In 1982 Gail became the first Associate Director of Equal Rights Advocates (ERA), a national public interest law firm based in San Francisco, whose mission is to protect and expand economic and educational access and opportunities for women and girls. As a leader in CMRW and CDRR, and her more than a dozen years’ with ERA, Gail was at the forefront of fighting for equity and justice in work and healthcare spaces. Gail began her career teaching social studies in Brooklyn, New York, and rural Massachusetts. She moved from teaching to developing alternative educational programs in higher education, and returned to K-12 as the Director of Communications and Public Relations with the San Francisco Unified School District. During this time, she received a Master’s in Curriculum at Brooklyn College and a Master’s in Counselor Education at Washington University in St. Louis. Recently retired, Gail is pleased to bring her energy, experience and expertise (focusing on coalition building, communications/media and fundraising) to Breast Cancer Action and to learn from staff, board, and members about how best to reach Breast Cancer Action’s health justice mission. Channte’ is a Public Health activist, administrator, trainer, motivational speaker, a health equity champion and a self-described breast cancer survivor. For 15 years, Channte’ has worked on issues that impact African American health ranging from diabetes, tobacco use, cancer disparities, and HIV/AIDS. She currently serves as the Director of Programs for NAATPN, Inc., a national organization that addresses tobacco use, cancer, and HIV within the African American community. She has traveled across the country to provide training and technical assistance to federal and state agencies, faith-based institutions, appointed and elected officials, volunteer organizations, and Historically Black Colleges and University (HBCU) about how to reduce health challenges that impact communities of color and how to mobilize communities to influence policy change. Channte’ serves as a co-organizer for the State of Black Health National Conference, an event that provides feasible solutions to solve the most complex health challenges in the African American community. She also serves on the African American Leadership Council for Compassion and Choices, a national organization that addresses end-of-life care, and on the Board of the Community Advocacy Committee (CAC) for Wake County, North Carolina. Channte’ has served as an Adjunct Professor in the Department of Public Administration for seven years at North Carolina Central University, where she focused primarily on public policy, personnel administration, and organizational theory and behavior. She received a degree in Communications from North Carolina Agricultural and Technical State University and a Master’s in Public Administration from North Carolina Central University. Karen has lived in the Bay Area for many years and has significant experience working with community-based organizations on social justice issues. 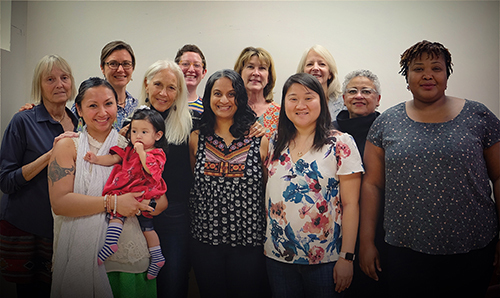 At the Mental Health Association of San Francisco, Karen was responsible for convening diverse groups and motivating action toward one common goal: safe, independent living for those with mental disabilities. Prior to that she had been with HomeBase, a Center for Homelessness Policy, then based at Public Advocates, a nonprofit law firm in San Francisco. She has also served as a consultant to Bay Area foundations. While raising her family, Karen volunteered at her children’s school and developed a support group for parents of unique learners, successfully advocated for a new staff position for a learning specialist, and later took on the lead role in the school library program. Karen also worked with the Immigration Legal Resource Center as a volunteer consultant, designing and implementing a rapid response system to assist those swept up in Bay Area raids and calling for national policy changes. Karen has previously served on two Boards of Directors, for local and state-wide policy and advocacy groups. She earned her BA from the University of California at Santa Cruz, where she was part of creating the Women’s Studies major, and her JD from Stanford University Law School, where she co-chaired the Women of Stanford Law. Like all of us, Karen feels she has had an unacceptable number of personal colleagues, friends and relatives who have had or currently suffer from breast cancer. Her work has long been about addressing social, economic and political inequities. Joining the Board of Breast Cancer Action is another way of addressing these issues. Yamini Ranchod is an epidemiologist interested in the social determinants of health. Her research has included work on exposures such as neighborhood health effects, early childhood adversity, diet and physical activity and outcomes such as cardiovascular disease, pregnancy-related and cancer-related outcomes. She received her B.S. in Economics and Biology and her Ph.D in Epidemiology from the University of Michigan and her M.S. in Epidemiology from the Harvard School of Public Health. Yamini completed her post-doctoral training at UC Berkeley. Yamini was diagnosed with breast cancer at the age of 31, while completing her Ph.D. After navigating the challenges of a breast cancer diagnosis and treatment at a young age, Yamini connected with individuals and organizations who shared her drive to support and improve the lives of women at risk of and living with breast cancer. She is committed to working with organizations focused on reducing the burden of breast cancer. Yamini is especially interested in the role of the environment on breast cancer risk and disparities in breast cancer risk, treatment, and survival. Lee Ann Slinkard has a long record of success building teams and methodologies in software serving government and healthcare organizations. These solutions empowered patients and citizens all over the world. Most recently, she served as Vice President for a company that partnered with global health delivery providers to implement a wearable vital sign monitoring device to collect data enabling the prediction and prevention of life threatening conditions. This technology will be a game changer as our populations grow larger and get older. Lee Ann is an Oakland resident and takes advantage of any opportunity to hike or golf. CoCo Villaluz is a Senior Community Development Manager for ClearWay MinnesotaSM. CoCo is Hidatsa from the Three Affiliated Tribes, Assiniboine from Fort Peck/Fort Belknap in Montana, and Chamorro from the island of Guam. CoCo has over eighteen years of experience in all phases of community development, capacity building and mobilizing. She has experience in addressing the sacred use of tobacco, as one of the founding members of the Native American Tobacco Coalition of Montana (NATCOM), and has partnered with many diverse organizations such as Tobacco Policy Sharing Knowledge in Native Societies (TPSKINS), the Campaign for Tobacco-Free Kids, the American Cancer Society, and Many Voices, One Message. CoCo has presented at regional, statewide, national and international conferences, including the Global Youth Advocacy Training in Washington D.C. She has also participated on the FDA Stakeholders discussion for American Indian communities. Some of CoCo’s proudest accomplishments include passing the Fort Peck No Smoking Resolution for her tribe, being selected to present at the Auahi Kore (Smoke-Free) Conference in Aotearoa (New Zealand), and passing the Ohinni Candi Wakandapi/Chani Wakan K/Nusa Commercial Tobacco-Free Ordinance for her home community. CoCo incorporates different art forms into prevention activities to address commercial tobacco control. Her overall goal is to promote indigenous cultural wellness of our communities for generations to come. CoCo is the recipient of the National Indian Health Board 2016 Regional Area Impact Award for advancing American Indian and Alaska Native health. And she was selected a keynote panelist at the National Conference on Tobacco or Health in Austin, TX in 2017. Belle Shayer turned from breast cancer patient to breast cancer advocate after her second bout with the disease in 1988. She is a founder of BCAction, was the organization’s first treasurer, and has served on the Board of the National Breast Cancer Coalition. Belle is an active member of BCAction’s Speakers’ Bureau, and currently serves as well on the Board of the State of California Women’s Health Council. Belle is self-employed as a bookkeeper/accountant and private conservator.